This month, the company hit a major milestone on its quest to get to suborbital space, capping off Phase I of a research grant with NASAwith a pair of successful proof-of-concept launches demonstrating the company’s one-two punch of ram acceleration and chemical combustion. HyperSciences put its vision to the test at Spaceport America, conducting a series of high-altitude tests at the desolate launch site an hour outside of Truth or Consequences, New Mexico. The company launched “a number of projectiles,” ranging from 1.5 ft long to over 9 ft long. HyperSciences sent up some off-the-shelf electronics in the process, in a partnership with an aerospace research group at the University of Texas. Oddly enough, the whole thing started after HyperSciences founder and CEO Mark Russell drilled a bunch of really, really deep holes. Russell formerly led crew capsule development at Jeff Bezos’ space gambit Blue Origin before leaving to get involved in his family’s mining business. At Blue Origin, he was employee number 10. Russell’s experience with mining and drilling led him to the idea that by elongating the chemical-filled tubes that he’d use to drill in the past, the system he used to break up rock could go to space. A hypersonic propulsion system can launch a projectile at at least five times the speed of sound, causing it to reach speeds of Mach 5 or higher — more than a mile a second. Most of the buzz in hypersonic tech right now is around defense technology — missiles that travel fast enough to evade even sophisticated missile defense systems or strike targets so quickly they can’t be intercepted — but aerospace and geothermal energy are two other big areas of interest. To that end, HyperSciences is maneuvering to the fore of non-weaponry hypersonics applications. The company sponsors theUniversity of Washington lab that’s pioneered applications for ram accelerator technology it uses and has sole rights to the tech invented there. On the geothermal energy note, with $1 million from Shell, HyperSciences was able to develop what it calls a “common engine” — a hypersonic platform that can drill deep to reach geothermal energy stores or point upward to launch things toward the stars. “HyperSciences is about getting really good on Earth first,” Russell said, pointing to one advantage of the cross-compatible system that lets the company apply lessons it learns from drilling to its plans for flight. 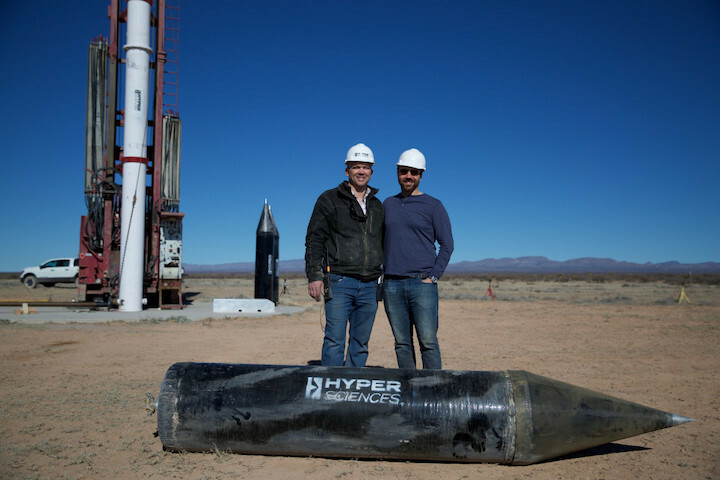 Though there have been rumors of acquisition interest, for now HyperSciences is pursuing an offbeat crowdfunding model that’s certainly out of the ordinary in a literally nuts and bolts aerospace business. The company is currently running a SeedInvest campaignthat allows small, unaccredited investors to put as little as a thousand dollars toward the team’s vision. At the time of writing, the campaign was sitting at around five million dollars raised from nearly 2,000 relatively small-time investors.